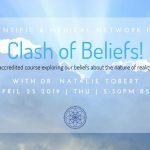 Presented by Dr Natalie Tobert this comprehensive course Culture, Spirituality and Health: Clash of Beliefs offers seminars that explore new spiritual and cultural frameworks for understanding unusual experiences. It explores what it means to be human in today’s world. The case studies provided in the training explore radical challenges to our common consensus.